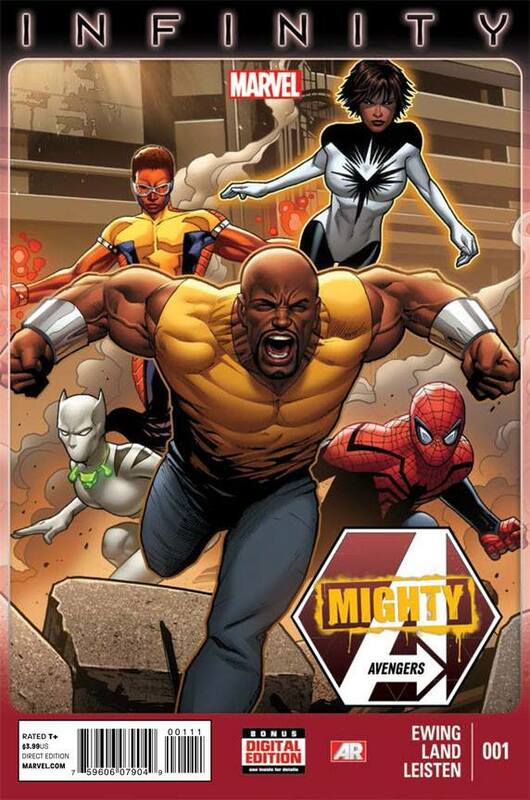 Recently black comic book readers were titillated by the announcement of the new “Mighty Avengers” series due out in September. The line-up boast such Black Heroes as Luke Cage, Monica Rambeau; now known as “Spectrum”, Blue Marvel, Falcon, and Black/Hispanic Victor Alvarez; the new Powerman. Finishing out the team are the Superior Spider Man, She-Hulk, White Tiger (Ava Ayala), and a new Ronin (Alexei Shostakov). Although a “Black” Avengers team was talked about, the powers that be didn’t want to put together an all-black cast, which executive editor, Tom Brevoort said would be ghettoizing (his words) and artificial. He went on to say that putting an all-black team together would feel “fake” because it keeps them away from other characters. Finally, he says that the late Dwayne McDuffie was a major influence in the creation of the team. McDuffie wanted a team that was 50% non-white and non-male. All in all, a team with a good racial and gender mix. But does this warrant the team being called the Black Avengers? In the whole of Avengers history, including the New Avengers, Secret Avengers, Uncanny Avengers, Young Avengers, and the Avengers Resistance, there have only been 19 Black men and women on the roster. Of the 19, only 4 are women, and only one of those is currently active, and another one slated to see action this year. Of the 15 men, 5 are active, with another 5 due to see service this year. 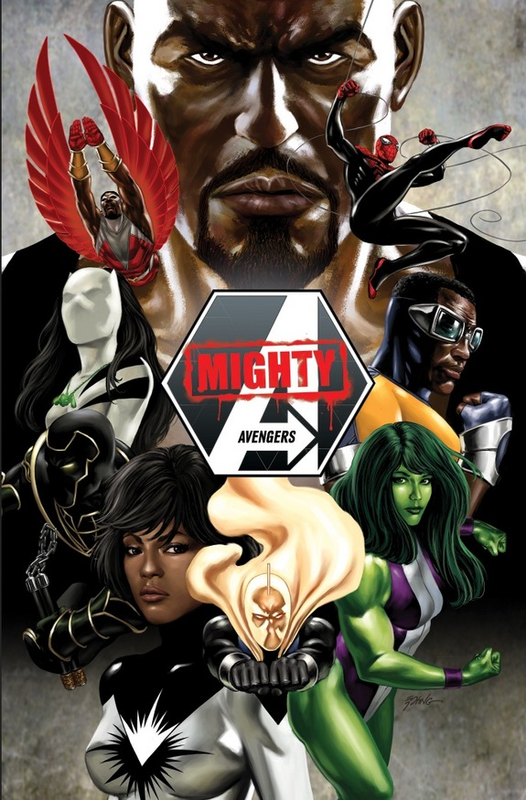 With all these characters to choose from, I asked myself, if a real Black Avengers team could have been chosen. It should be noted that this isn’t the first time the title “Black Avengers” has been thrown around. Writer Christopher Priest is quoted as saying his limited series, “The Crew” flirted with the name “Black Avengers” at one point, and writer Reginald Hudlin, during his run on Black Panther, teamed a group of black heroes together, which included Luke Cage and Photon, that had the makings of an all-black team, and even in later issues, included Luke Cage speaking to his wife about a Black Avengers team. These earlier jabs at the idea seem to have kept the fires stoked for a team with a predominate make-up of Black Heroes. To their credit, two characters that started strong, Blue Marvel and Powerman have been brought back, and after a long hiatus, we see the reemergence of Monica Rambeau, now called Spectrum. All can be considered pleasant surprises to be sure. The one addition that seems forced would be the Falcon, who seems to show up everywhere. But even with their inclusion, this may qualify them as black, but as Avengers? During the Dark Reign period, as Norman Osborn contemplated his “Dark Avengers” squad, he, with the help of Ares, figured out the “formula” for putting together the perfect Avengers team. That formula consisted of positions labeled the Knight and the Soldier. Or rather the symbolism; represented by Captain America and Iron Man; that they stood for. This was the motivating factor behind his “Iron Patriot” persona and him trying to make his son into the next Captain America, called “American Son”. Using Norman’s formula, could we have come up with a different team? It should be noted that of all the teams to call themselves “Avengers”, the Resistance squad boasted the largest number of active blacks on its squad (4). The new team of Avengers will boast 5. The relevance of this comes in the fact that between 1960 and 2000, there were only 6 black members total. From that we can glean that maybe times are changing. Maybe. And if times are changing, maybe an all-black squad isn’t so fake or ghetto after all. Here is the complete list of Black Heroes that have called themselves “Avengers”. As you browse this list, see if you can put together your own team. Who knows, you may come up with a better one. Why does Falcon’s inclusion seem “forced,” and what do you mean when you say he shows up “everywhere?” He currently appears in one Avengers title and maybe periodically in Captain America’s solo title. He’s the first costumed African-American superhero in comics. If anything, I’d like to see him in his own title as well. The Falcon had his own title back in 1983, which was a 4 issue limited series. His membership seems forced for the reasons you named. He is the first African American hero, and due to that, just as they do Spiderman, he seems to be included to add legitimacy. He is already a member of one Avengers squad, now to stick him on this one seems redundant. Having a four-issue limited series over a quarter of a century ago is not the same as having an ongoing series in the present-day. I don’t see how adding him to the title “adds legitimacy.” The Black Panther is the first black superhero, and he’s not in there. Maybe they just thought Falcon would be an interesting addition to the team. As for redundancy, his inclusion is no more redundant than Wolverine, Captain America, Iron Man, Hawkeye, Black Widow, Thor, or any of the other myriad number of characters who appear in multiple titles — including some with their own solo titles — and are members of multiple Avengers teams. Believe it or not I agree with you on the Falcon series, the thing is that he has not changed in all this time. As another individual pointed out, he is the “safe” black hero. In my opinion, I feel that the reason falcon seems forced because to me he’s always been the “safe” black male hero pick. Until recently he’s never had any real weapons or powers and he’s always been Captain America’s boy. As for naming a super team called the black avengers, that comes off as cheesy and cheep. Especially if they are in the hands of white writers who’ll probably not due them any kind of justice. Hell, I don’t even think this mighty avengers series is gonna last.That’s why we’ll NEVER SEE a solid black panther movie or in any future Avengers movies other than a background or cameo appearance. That’s just not an image that white America wants black America to see. That’s not me being prejudice it’s just the truth. Luke Cage has never struck me as being a leader of a super hero team. To me he’s always been more of the muscle. What if Black Panther and Storm formed a team with Luke Cage, Spectrum,Blue Marvel,Dr. Voodoo,Captain Universe,Bishop or Falcon…scary thought huh. I know this is pretty late, but Luke Cage has led the Avengers before, multiple times actually. The Falcon is never going to grow as a character unless he’s regularly featured in an ongoing comic where he can be developed. The other Avengers title that he’s in has well over a dozen other characters being featured which means that his on-panel time will be very limited at best. Putting him on a smaller team will mean more room for him to be utilized and developed. That’s just common sense. Besides, he’ll be making his big screen debut in the Captain America movie next year, so he it only makes sense that Marvel would want to raise his profile in the comics. And really, seeing how Marvel currently doesn’t have a singleMarvel Universe-based title starring a solo black lead, I don’t see how Falcon appearing in 2 Avengers title is a bad thing. It’s not a bad thing it’s just the “safe” thing. Why not Black Panther?!? He was in the Avengers cartoon first and coming off a successful DVD aaaannnnd is easily the most popular black male hero in comics….Too black too strong. True, but one is considered a very strong black symbol and character while the other has always been the robin to Cap’s Batman or the back up guy who never really had any considerable powers. And I still don’t understand his new wing daggers of light. The Falcon debuted in the Captain America comic. A few months later, his name was added to the title as a co-star. Compare that to Robin in Batman’s book, whose name never appeared as part of the official title of his comic. Similarly, there have been other comics where this has taken place. Green Arrow was made a co-star in Green Lantern’s title. Iron Fist was added to Luke Cage’s title. The Black Widow was given co-star billing in Daredevil’s title. Yet, I’ve never heard anyone refer to Green Arrow as Green Lantern’s back-up guy, or Iron Fist as Luke Cage’s back-up guy, or the Black Widow as Daredevil’s back-up girl. But somehow, this perception is placed solely on the Falcon. Quite a double standard. In addition, exactly what is considered to be “considerable powers?” Captain America HIMSELF has no superhuman abilities. Does that somehow make him a lesser hero than other heroes that do have them? Not that I’ve seen. The Falcon, in addition to having been shown to be a formidable hand-to-hand combatant, has been displayed as having the ability to control and see through the eyes of any bird on the planet. And if you don’t understand the Falcon’s “wing daggers of light,” I’m guessing you also had trouble understanding the very-similar light daggers that the Black Panther regularly used when Christopher Priest wrote his title. Speaking of which, the Black Panther may be considered a “very strong black symbol,” but certainly wasn’t always the case. In fact, it wasn’t until he was given his own title and written by Christopher Priest that he reached the status that he’s at now. Even Priest himself said that he even hesitated to write the character initially because the Panther was basically one of the background characters in the Avengers that was usually among the first to be knocked out in fight. And incidentally, the Panther, prior to Priest, had virtually no superhuman powers — other than seeing in the dark — or weapons that he used. Sound familiar? The Black Panther reached his current status only after Marvel gave him his own title and a writer that cared enough to develop the character. The Falcon has never been given that chance, and he’ll never be developed as a character or have the chance to outgrow the wrong perception that some have of him as a character unless he’s appearing in a title with a writer that will give him the proper treatment. And if the only chance of that is having him appear in a second Avengers title with a smaller cast, then I say bring it on. Great points to be sure, but while it is true the Falcon hasn’t had his own book in 20 years, he is never out of the picture. From the Defenders to the Avengers to Captain America. House of M, and a major part on Cap’s “Secret Avengers” in the Civil War.he appeared in the Black Panther (Hudlin’s and Priest’s run), Shadowland, Heroes for Hire, and back to the Avengers. Oh yeah, don’t forget about AVX. The comparison between the Black Panther and the Falcon is unfair. If there were someone that they paired the Black Panther with that was as successful as pairing the Falcon with Captain America, then by all means, we would have seen that book published, but unlike Power Man and Iron Fist or Daredevil and the Black Widow. the combo was not found. As for the guys with the multiple teams and solo titles, we know that is due to their popularity, or in the case of Spiderman, due to their iconic status. (Spiderman is the grand patriarch of the Marvel universe appearing in the modern incarnation of the marvel universe in 1962). Cap is not superhuman. Every Marvel Universe handbook lists him as “peak human,” which basically means that he is at the pinnacle of human fitness and conditioning. Its the same as say, Batman, and its why you never see Cap performing superhuman feats like lifting cars. And incidentally, Cap had the super-soldier serum purged from his body years ago by Henry Pym way back in CAPTAIN AMERICA #378. Seems like a bad precedent to my mind- who would want a group of superheroes known as the “White Avengers”(which until Captain America recruited the Black Panther back in the 1960s is precisely what they were) whose main thing they had in common was skin colour- any more than gender?